The universe of hybrid and electric cars in the Brazilian automotive market breaks out of inertia with new ongoing projects. But until then it is an & # 39; augmented reality & # 39; for customers, say futurists and money makers. Perhaps this could change with the announcement that Caoa Chery prepares and structures for the revelation of the sedan Arizzo 5th ("e" of electrical) and probably the Tiggo 7 hybrid, which will be produced at the Jacareí plant, in the interior of São Paulo. The first phase of electrification of cars in our country is still primarily in relation to China, the largest market in the segment. So the technology will come from there, but the production will be done here to have lower costs and to place the models in stores with the "cheaper Brazil" label. For Caoa Chery, the models will still function as their first electric, but also more luxurious models at the same time. In the menu with offers in the current national scenario of the 100% electric are the Nissan Leaf, Renault Zoe, Chevrolet Bolt, BMW i3, from the Chinese JAC iEV40, in addition Jaguar i-Pace is coming. Owners of unattractive values, the aforementioned models are questioned by many consumers, but they serve as a parameter for the beginning of this new era of taking the place of the fuel pump. JAC is currently the cheapest, starting at R $ 140,000, almost double the price of the T40, the combustion model from which it is derived. 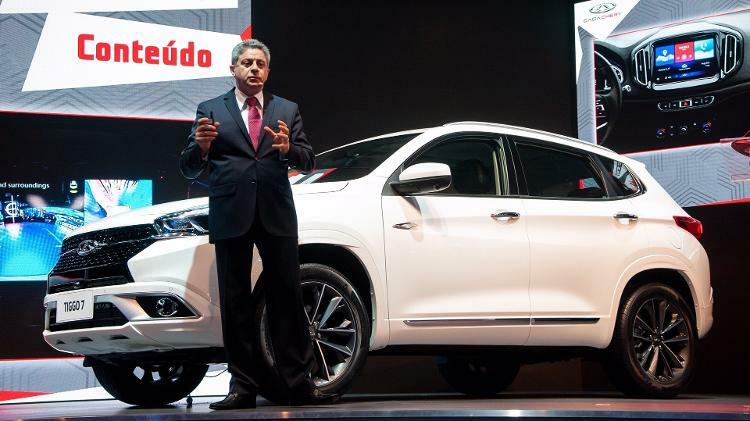 To enter the segment on the right foot, the Caoa Chery will fall with a hybrid and an electric that together form part of the original plan for electrification of the brand led by President Márcio Alfonso, who gave "99% certainty" to the project. The executive here in China revealed that the Arrizo sedan, because "also serve the rental and special sales market [vendas diretas]", is the biggest candidate to start with next year. An electric Arrizo 5 with something between 350 and 400 kilometers of autonomy, even twice as much as its combustion counterpart (currently between R $ 65 thousand and R $ 72 thousand), would still have the chance to get the label under R $ carry 140 thousand. A Tiggo 7 hybrid can have its value in the $ 150 thousand home (the conventional costs $ 107 thousand) and still looks good on tape. It is good to remember that some of the vehicles were already exhibited at the São Paulo motor show last October – in addition to Arrizo and Tiggo, we had the eQ, an electric version of QQ, that could even raise rumors for $ 50 thousand – apparently the costs of this model did not end with reality. the Caoa Chery also develops cars in laboratories in China and Brazil. The president of Caoa Chery reinforces the importance of not only being present but also participating in the competition by offering a technology supply, design and attractive price. A major challenge will be to organize the multiplication of charging stations in terms of infrastructure. Volvo recently entered into national partnerships with the shopping and a supermarket chain to install the chargers. BMW also has agreements with the shopping, apartment buildings and a worldwide network of snack bars, but there is still much left! For the hybrids, the story may be another: Prius, Lexus NX, UX, ES, LS and the new RX is already]to there. The new Corolla arrives in October. In addition to the Porsche Panamera, BMW 530e, Mini Countryman, Volvo XC 60 and XC 90 are in the scenario of offers. Land Rover is starting to electrify its SUVs in the coming months when the network will receive vehicles plug-in. The new generation of Chery products seen here in China forms the basis for strengthening the technology used in Brazilian products. Henrique Sampaio, the automaker's marketing manager, refers to the "Lion" artificial intelligence that helps the vehicle drive, also linked to the ACC, which is expected to reach Brazil later. Infotainment systems with greater connectivity are also being explored in the "Shanghai Auto Show" because the Chinese salon is called international. They will certainly be on the national Chery Caoa models. The debut is scheduled for the last quarter in Tiggo 8. * Jorge Moraes is a journalist, digital influencer, jury of the UOL Cars Prize and speaks about technology in cars.